Jeff Lange brings you this latest DVD in a series that features one-of-a-kind Disney experiences that you can only find in the Disney theme parks! 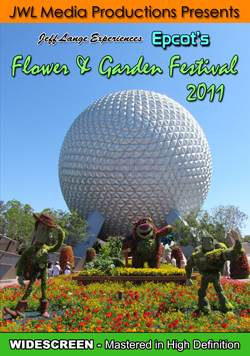 In this edition, we celebrate spring at one of Disney’s most anticipated events of the year: The Epcot International Flower and Garden Festival 2011. Relive these special memories year after year or enjoy the magic for the first time by purchasing “Jeff Lange Experiences Epcot’s Flower & Garden Festival 2011”.